By 2020 it is estimated that 12 million elderly Americans will require long-term care and constant monitoring. This presents a tremendous opportunity for a company to develop a minimally invasive solution for monitoring patients outside of a clinical setting. While several companies have devices in the pipeline, few have yet achieved FDA approval and hit the consumer market. However, there is at least one exciting start-up which has already brought their solution for this largely unmet patient need to market, though it will be how the company performs over the next 12-18 months that will spell their fate. One such product is AFrameDigital’s technology, which provides individuals and their loved ones with peace of mind in an attractive, personalized device they can wear 24/7 to monitor activity, location, and physiological status in real time, indoors or outside. The device contains sensors to detect impacts or falls and provides personalized alerts to emergency responders and family members without the push of a button. 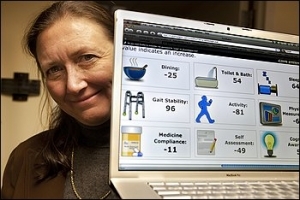 AFrameDigital (AFD) was founded in 2005 by Cindy Crump to develop intelligent health monitoring for individuals in rehabilitation and long term care. The company website lists four women among the company’s five core executives and eight total employees, which is rare to say the least for a start up in any industry. Thus far the old adage that women mature faster than men has held true for the AFD team, as they are the first to market in a sub-sector of mobile health that is only going to get more crowded and noisy in the coming months/years. That said, it remains to be seen whether AFD will earn distinction as a disruptive AND scalable technology bound for a lucrative exit or find themselves wading in the “deadpool” (Silicon Valley-speak for failed startups) when competitor devices come to market. The company was featured in the Washington Post in July as an up-and-coming Metro-area technology start-up to watch. In their piece the Washington Post quoted CEO Crump asserting,“Our subscription-based monitoring solution creates a virtual safety net in senior living, rehabilitation hospitals and home settings so that care givers can respond more quickly to falls and subtle changes in a patient’s unique wellness profile which often precede falls”. The watches sell for $350 plus a $79/month subscription fee for home users, but the price of the device is $850 when sold as a kit with other equipment, such as wireless routers. This is certainly not cheap by any means, and definitely above average for comparable devices, but the patient groups targeted by the company are typically older and not necessarily unwilling to pay top dollar for new technology that adds even modestly to their overall quality of life. AFD was bootstrapped since inception with $5.4 million in funding from the Department of Defense Advanced Research Projects Agency (DARPA) as of late 2010, and was recently awarded a NIH grant for a study of 30 independent living resident volunteers, in collaboration with the University of Virginia and Vinson Hall Retirement Community in McLean, VA, intended to capture “normal activities of daily living”. “Vinson Hall’s goals and understanding of the technology makes them an ideal partner for this follow-on research”, noted AFD’s Senior Research Scientist Amy Papadopoulos. “This new phase will bring in the expertise of the University of Virginia’s Department of Electrical and Computer Engineering and its development of body sensor networks (BSNs) to gather data from additional locations such as the chest and legs”. One feature which I think truly distinguishes AFD from its potential competitors is the wander assessment and management element. The watch can issue “hot zone” alerts at exits and defined “lurking” areas within a patients home or community so individuals suffering from Alzheimer’s or Dementia can be afforded more personal freedom than is typical without putting them at heightened risk. The device also intelligently detects and reports on activity pattern changes, silently and discretely alerts staff or caregivers to gracefully manage exits, falls, and attempts to disable the system, and integrates with electronic door locks and legacy systems for elopement control. The system supports integration with existing alarm/call bell systems or other monitoring systems and devices the customer may already have purchased. This allows customers to preserve existing capital equipment investment in other systems while cost effectively enhancing situational awareness. Devices already integrated with the system include a glucose meter, pulse oximeter, weight scale, heart rate sensor, and a blood pressure cuff, each of which interface wirelessly with the MobileCare Monitor through Bluetooth. 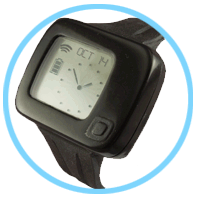 Information collected by the watch and other available sensors is reported to the CareStation Web Interface, which may be accessed via desktop computer or a mobile PDA. Its unclear whether the wrist-worn sensor in the MobileCare Monitor solution will have a complementary mobile application available for Smartphones or Tablet PCs, but considering the uncertainty surrounding FDA policy for regulating devices with complementary mobile software applications, it is unlikely in my opinion. The MobileCare Monitor solution received FDA 510(k) approval in late 2009 and were it to add a mobile app component now it may undermine the current regulatory status of the device and force the company to re-apply for FDA 510(k) approval. One notable deal AFD has made was licensing is technology to Reflection Solutions, a start-up which has developed a mobile monitoring software platform which combines AFD’s sensor with Sprint-powered 3G/4G devices to provide subscribers with a mobile long-term care solution which is “always on”. 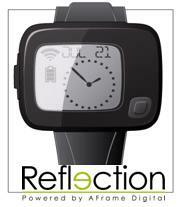 It is unclear whether Reflection’s mobile software was subject to additional FDA review as an “accessory” to the sensor device. While AFD has several customers paying full price for its products and services, the company must remain mindful that competitors are closing the gap quickly, including WiMM Labs and Emergency Medical Technologies (EMT) which the iMedicalApps team has previously covered. Emergency Medical Technologies has made an impressive debut of their Wriskwatch mobile cardiac arrest monitor, which recently completed multiple successful trials at the Cleveland Clinic, and will definitely be a force to be reckoned with once it clears FDA review (stay tuned for my interview with EMT CEO Bernard Klocman). WiMM Labs is much more of a direct competitor to AFD than EMT, but it is still to0 early to judge how the company’s “open source hardware” model will resonate with developers. To be sure, both companies are developing wrist-worn devices for the purpose of providing mobile care passively to users via a non-invasive, unobtrusive platform, and competition is only going to get fiercer and more crowded moving forward. The following is a video from AFrameDigital’s YouTube channel which outlines the value proposition and cases of the MobileCare Monitor. We will keep you posted on further developments with AFrameDigital’s products.